All the used materials are the physical result of a series of actions, made by the artist in a former garage of the SBB (the Swiss Railways) few days before its demolition to make space for the advancement of a new building complex. Treated as architectural fragments, doors and plasterboard panels are salvaged materials, which shift and alter their function in respect to the space. The foreign exchange market or Forex is the largest market in the world, including the exchanges between banks, currency speculators, multinational corporations, governments, and other financial markets and institutions. An online platform shows graphically the evolution of the market in real time. 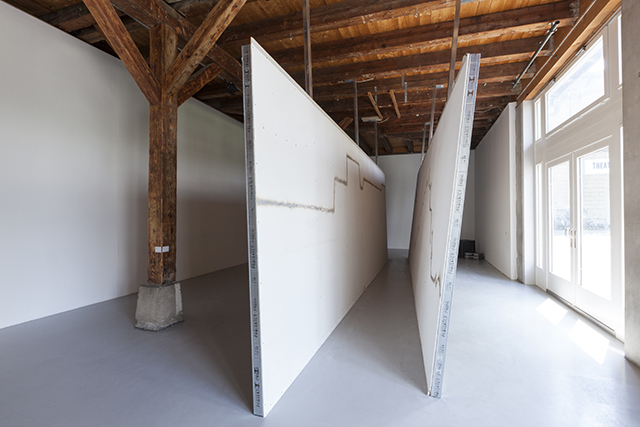 In an intervention in the former SBB-garage, following the perimeter of three rooms the artist transposed three “Forex” graphs by acting directly on the walls and drawing the corresponding lines. The three graphs on the walls corresponded to the linear view of exchange between EUR/USD, EUR/CHF and EUR/CNY in twenty minutes of market. The line of the three graphs became then the path for the flame of a soldering torch. The shift proceeds from the abstraction of sign – the line as a graphic reduction imposed by the economic-financial codes – to the physicality of gesture. The installation in Kunstraum Walcheturm re-enacts this process, by transposing the burnt walls in a new architectural environment.